We have Engine Rebuild Kits available to rebuild Briggs & Stratton engines. All the parts commonly required are included. Rings, Gaskets, Valves and pistons are in the engine rebuild kits. 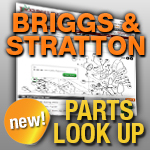 Or you can make your own rebuild kit to your exact specifications for Briggs & Stratton Engines by clicking Here.